I first met Mr. M in the lobby of the OAC. I was rushing off to do something else when he flagged me down and asked me about our job readiness program. I assumed he was another guest wanting an answer to a question that he should be asking at the front desk-but I was very wrong! He seemed like a nice enough guy when I met him but I had no idea that he would prove himself to be one of the most successful and focused job readiness students I have ever worked with. When Mr. M first came to us, he was staying in a shelter, working on his addiction recovery, and just beginning to piece his life back together after some trying times. After a few weeks of job readiness training, Mr. M found a job. Soon thereafter, he found a second job! Over the next few months, Mr. M occasionally came in to the OAC just to say hi or to receive services. 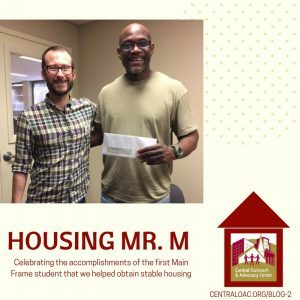 After one of those visits we found out that we had been given access to a significant amount of money earmarked for housing for Main Frame students through the United Way. Mr. M and I met and began to talk about the possibility of assisting him with rent. Soon enough, Mr. M had found a room to rent, had a contract drawn up, and was able to move in and pay the first month of rent (with a little help from the OAC and the United Way). Since then, Mr. Murphy has paid the second month of rent by himself and is working with us on budgeting and saving strategies to help set him up for success over the long run. It has been a pleasure to work with someone so focused on achieving self-sufficiency. Often when we work with guests, we don’t see the success they achieve after they leave us. Especially when we help people with supportive services, we don’t know if they are able to get housing and employment with the identification we help them obtain. It has been really rewarding to see Mr. M progress from someone struggling with addiction and living on the street to someone who has two stable jobs and is able to pay his own rent. We are incredibly proud of what Mr. M has accomplished and his story gives us hope.